Stars: Rock Hudson, Doris Day, Tony Randall. 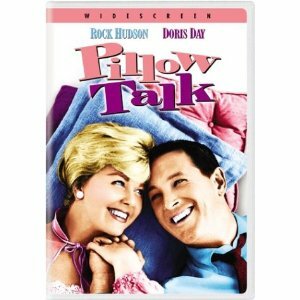 From the moment those credits roll, with Doris and Rock gaily tossing pink and blue satin pillows in the air while Doris’s honey-smooth voice sings “there must be a boy, must be a pillow, must be a pillow talkin’ boy for me,” you know you’re in for one surreal romp. Originally billed as a “sexcapade,” Pillow Talk is a bizarre little gem from an era before Vidal Sassoon, Clairol Herbal Essence Shampoo, the short and sassy look, or that stuff your hairdresser gives you to “scrunch” with for a natural look. Doris Day plays Jan Morrow, a freckle-nosed, no-nonsense career girl in a silver helmet wig, the hairs of which wouldn’t dare stir even in nuclear blast. Smooth talking Brad Allen, a lothario who shares her party line, is determined to get Jan to let her hair down in more ways than one. The boundaries of her conversations violated by the vagaries of 50s era telephone technology, Jan is determined to retain her dignity, her privacy, her flawless ‘do, and her virginity, which makes sense given her options for risk management in the pre-Pill, pre-feminist era. Next time you’re seeking simple solutions and unwilling to look too far below the surface, slip into some pink pajamas, curl up with a few fluffy pillows, and pour yourself a nice grasshopper or pink lady to sip while you enjoy this frothy little piece of Americana.